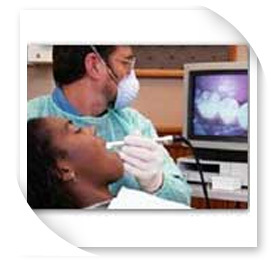 Intraoral Camera is an advanced dental treatment technology which allows both dentists and their patients to clearly see teeth on the SiVsion Monitor in front of the dental chair. Moreover, this technology can display X-ray images and captures to illustrate the dental instruction and provide more detailed information to patients. Asavanant Dental Clinic has had this system in the dental rooms of the new building since May 2008. If you've ever wonderedwhat your dentist sees when examining your teeth , a new device called the intra - oral camera can be used. An intra - oral camera is essentially a small television camera fitted onto a pen-sized wand. By placing the device inside your mouth , your dentists can exploreand record images 40 times larger than the actual size. The camera is connected to a video monitor that stores and displays the digital photos as a visual record. Dentists use this device to help diagnose a patient's and health status. We've also discovered that the patients understand their oral health status better after viewing their mouth close - up! 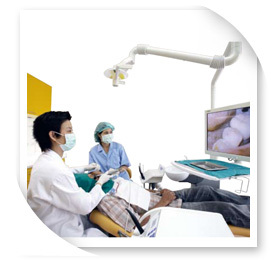 This technology has been introduced to our patients at Asavanant Dental Clinic since January 2000.